We are no longer offering takeout during the hours of 3:00pm-6:30pm. This entry was posted in Blog on August 1, 2013 by mike. We are booking summer catering right now! Call today to book your summer event at 716-884-1033. We offer drop off catering with 2 days notice for 10 or more people. You can customize your meal to your liking – apps, sides, salads, entrees & desserts a la carte – so mix and match whatever you feel like! Email mike@panaros.net with any questions. This entry was posted in Blog, Featured on July 8, 2013 by mike. Stop in and see the new and improved Panaro’s Restaurant with additional seating to accommodate at least 50 guests. We are back open for lunch from 11am-3pm Monday through Friday. We are booking the restaurant for private parties now for the holiday season – call Mike at 716-884-1033 for availability! This entry was posted in Blog on December 8, 2011 by admin. Panaro’s will be expanding the dining area which will enable us to have more seating and will also be able to book larger parties in the restaurant. Construction is currently underway and we hope the restaurant will be functional in the next 3-4 weeks! We will keep you posted on details as we move further! This entry was posted in Blog on October 21, 2011 by admin. Panaro’s Restaurant Updates: Panaro’s will be expanding the dining area which will enable us to have more seating and will also be able to book larger parties in the restaurant. Construction is currently underway and we hope the restaurant will be functional in the next 3-4 weeks! We will keep you posted on details as we move further! Panaro’s will be closed Thurs/Fri/Mon July 15, 16, 19 for Italian Festival! Come visit us on Hertel near Crestwood where we will be serving braciole, banana peppers, pasta fagioli, meatballs and Chef Tony’s award-winning Chocolate Cassata Cake! This entry was posted in Blog on July 12, 2010 by admin. Panaro’s Wins Nickel City Cake Challenge! Saturday’s Nickel City Cake Challenge: Wedding in Buffalo was a smashing success! Of the three professional competitors, Tony Concialdi II of Panaro’s on Delaware Avenue in Buffalo won the trophy with his delicious chocolate cake filled with a sweet, whipped ricotta and topped with fondant. What appeared at first glance to be a traditional wedding cake was actually an ode to WNY’s favorite foods. The base layer was made up of individually sculpted beef on weck sandwiches and a pepperoni pizza made of fondant and white chocolate. Sculpted suicide wings dripping with “sauce” augmented the individual layers, and to top it off, a poured sugar beer bottle topper took the place of the more traditional bride and groom. Concialdi’s cake may have been the epitome of the challenge’s theme. Stunning interpretations of the theme were also delivered by Zilly Rosen of Zillycakes and Susan Spider of Pumpernick n’Pastry Shoppe. Rosen’s cake depicted edible an homage to a dozen of Buffalo’s most architecturally stunning buildings–buildings where, as recently as the morning of competition, Rosen has delivered wedding cakes to blushing brides. Spider of Pumpernick used her tried and true painting skills to decorate each layer of her cake with a different season. She and her assistant–Pumpernick’s owner, Suzanne Linde–were a shining example of preparedness and teamwork with each step of their project timed out and perfectly executed. Taking place in the stunning showrooms of Buffalo’s Artisan Kitchens & Baths, the Cake Challenge’s audience of nearly 200 Western New Yorker’s sipped from a Willy Wonka-esque DIY hot chocolate station and sampled sweet snacks fromBistro Europa, Lake Effect Ice Cream, Niagara Popcorn, and Niagara Culinary Institute. The Institute’s students provided savory nibbles for guests in addition to demonstrating technique-based decorating skills to interested audience members in the downstairs kitchen. – Hide quoted text – Host Bert Gambini of WBFO 88.7 hosted the event, entertaining the audience with facts and trivia about cakes and the world of cake artistry. When time was called the panel of professional judges (made up of ECC Pastry Instructor Kyle Haak, NCCC Pastry Instructor Maria Iacovitti, and food writer/newlywed Sarah Wally) deliberated while winners of the amateur contest were announced. Of the amateur entries that arrived, all were impressive, but the winners were Heather Harzewski of Lockport, NY and a trio of ladies from Cheektowaga–Jennie Wodzinski and sister Jackie, along with friend Dawn Stroh. Both of the cakes were voted to be the best of the bunch by the panel of professional judges and the audience. Nickel City Cake Challenge: Wedding in Buffalo was the first-ever sweet event for Feed Your Soul, the culinary event company responsible for the hit Nickel City Chef series. Tickets for Season Two of Nickel City Chef are on sale now (but not for long), and anyone interested in staying up-to-date on Feed Your Soul’s events can join the Nickel City Chef fan page on Facebook. A second Nickel City Cake Challenge is slated for October 2010. Panaro’s Restaurant Available for Private Parties!!! We offer a wide range of catering which includes breakfast, lunch, & dinner catering. We have catered 500 person parties as well as any party with 10 or more people. We have a complete catering menu available to download. If there are any food items not currently on our catering menu feel free to ask and we would be glad to look into it for you. Pharmaceutical Reps welcome – we cater to many doctor’s offices throughout WNY. This entry was posted in Blog on March 4, 2010 by admin. Panaro’s is a family owned and operated restaurant located in the Allentown area of Buffalo, NY. Mike and Tony Concialdi are partners in the restaurant but have a lot of help from family to operate the restaurant. You might be wondering why the name “Panaro’s”? Well, our mothers maiden name is Panaro and alot of what the restaurant is about is because of her. If you are lucky enough to have lunch in the restaurant you will notice that you will be surrounded by old family photos which include our Mom, Kathy Panaro/Concialdi. Unfortunately, she is no longer with us but her spirit lives on with us and in the restaurant from the old photos to her favorite flower…the sunflower. We are open Monday – Friday and serve lunch from 11am-3pm. Closed weekends for catering and wedding cakes. We also rent the restaurant out for private parties throughout the year. We also specialize in wedding cakes and any specialty cake you can think up. 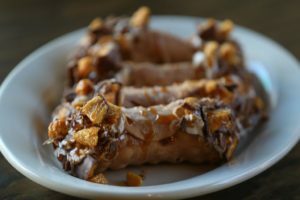 Check out our catering and dessert menus by downloading a copy from the link above. If you have any questions or interest please feel free to contact us at mike@panaros.net or by calling us at the restaurant…716-884-1033. Look forward to seeing you at the restaurant! Italian Cookies are $9.50 per pound and include fig, Italian chocolate, anise, sugar, sesame, butterballs, and dead bones. An assortment of pies and cakes are also available by viewing our specialty dessert menu. Time to Book your Wedding Cake?? Book your wedding cake tasting now to secure your wedding date with Panaro’s! – Call 716-884-1033 for availability. 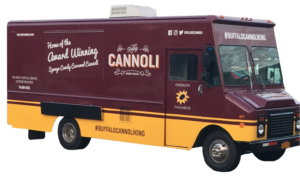 OUR FOOD TRUCK: THE ROLLING CANNOLI! Panaro’s is family-owned by brothers Michael Concialdi & Tony Concialdi. Tony is the Chef of the family and it was always Tony’s dream to open his own restaurant. Opening 10 years ago, we have been serving up lunches from their Allentown restaurant location, delicious wedding cakes, and catering all sizes of events in Buffalo from 10-people to 1000-people. Named in honor of our late mother Kathy Concialdi (Panaro), we wanted to honor our mom by incorporating her delicious family recipes into a business that would also provide outstanding catering and fantastic homemade desserts. We like to think that when you dine with us its just like eating Sunday sauce at grandma’s house! Catering: We serve up breakfast, lunch or dinner catering with the primary goal of ensuring that the people we’re cooking for will *love* the food they just ate and look forward to eating more from Panaro’s. Healthy options including homemade whole wheat panini’s and rolls, whole wheat pasta, and fresh salads adorn our menu. Give Michael a call at (716) 884-1033 and he can set you up with one of our popular packages or an order special to your needs. Lunch: If you are looking for some lunch, stop by our Buffalo location Monday thru Friday from 11am – 3pm.